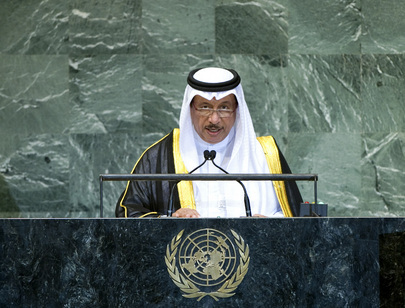 JABER AL MUBARAK AL HAMAD AL SABAH, Prime Minister of Kuwait, noted the numerous challenges the United Nations faced as it neared the end of its seventh decade of existence, during which period the Organization and all of its organizations and agencies had worked on resolving and containing many crises, as well as political, humanitarian and economic challenges. It was his view, however, that poor coordination, flaws in the joint and united action, the failure by some to fulfil their obligations, and antiquated mechanisms had made the United Nations incapable of reaching conclusive solutions for certain problems. It was, thus, incumbent upon all to work on reforming, developing and enhancing the Organization, as well as providing firm political will to promote its performance to face up to the renewed challenges dictated by an ever-changing international environment. He said, after two decades of discussions and in-depth negotiations to reform the Security Council, Kuwait reaffirmed the need to reform the Security Council to reflect the new international reality, and guarantee the rights of the Arab and Islamic States in being represented according to their size, their contributions, and their role in advocating the objectives and principles of the United Nations Charter. On the “bloody tragedy” that continued to unfold in Syria, he said Kuwait congratulated the Joint Representative of the United Nations and League of Arab States to Syria, Lakhdar Brahimi, and pledged to support him in his efforts, and reaffirmed its commitment and its support to the international efforts to reach a political solution in a manner that met the demands and aspirations of the Syrian people. He appealed to the international community to provide more humanitarian assistance to alleviate the pain and suffering of the Syrians inside and outside that country. Turning his attention to the Kuwaiti-Iraqi relations, he said those had witnessed a “remarkable and positive progress”, whereby his country had risen above the painful wounds of the invasion. At the regional level, Kuwait renewed its call to Iran to take serious and effective steps towards cooperation with the international efforts that sought to find a political settlement over its nuclear programme, and thereby dispel the doubts that surrounded the goals and purposes of that programme. That way, Iran would be sparing the region and its countries from further crises and conflicts that had regrettably become concomitant with that vital region. On Israel, he said that country’s continued occupation of the Palestinian territories represented a testament to the inability of the international community to find solutions that would end the plight of the Palestinian people. Kuwait, therefore, “demanded” of the international community, represented by the Security Council, to pressure Israel and subject it to the resolutions of international legitimacy, the principle of land for peace, the Road Map, as well as the Arab Peace Initiative that would guarantee the establishment of the Palestinian State with East Jerusalem as its capital, and the total Israeli withdrawal from all the Arab territories occupied after 4 June 1967. On Somalia, he hailed the ratification of the provisional constitution and congratulated President Hassan Sheikh Mohamud on his election as President of Somalia. He also commended the positive positions of the United Nations and the international community on Myanmar, in the hope that those efforts would result in the cessation of violence against the Muslim minority in Myanmar. Similarly, he joined the peoples and Governments of Islamic countries in their strong condemnation and outrage over the production of the film that denigrated the Prophet Muhammad and the Islamic faith, saying that irresponsible and impudent act had ignited extreme rage among the Muslim peoples and communities all over the world. He denounced the film, as well as the acts of killing and destruction that ensued, which are very far from the spirit of Islam. On environmental, economic and social and security issues that faced the world today, he noted that, despite the many accomplishments made by many States in reaching the Millennium Development Goals, many of those accomplishments did not rise to the set ambitions. Therefore, it was imperative to continue the joint efforts to limit the effects of those challenges and to contain them, in order to guarantee achievement of the noble goals. Concluding, he stated that Kuwait believed that dialogue, the dissemination of the culture of tolerance, moderation and the rejection of the manifestations of violence and extremism was the ideal way to advance the values of equality and justice and in turn reach the higher goal of maintaining international peace and security.